HomeCruisingCruise Ships and Drones, Are Drones Allowed On Cruise Ships? As drones continue to grow in popularity, each cruise line, port, and country have a different set of rules you need to abide by. There are a few things you need to know before thinking you can launch your drone from a cruise ship. Using a drone properly can reward you with incredible photos and videos that otherwise would be impossible to get. I’m a drone enthusiast myself, having both DJI and GoPro drones. Here is a rundown of what each cruise line allows as well as tips for getting the best possible video/photos with your drone while on a cruise. Are Drones Allowed On Cruise Ships? It is important to remember to abide by all local laws where you want to fly. In cities such as Rome, the punishment for flying a drone is jail time and up to a 100,000 Euro fine. They will also confiscate your drone and you’ll never see it again. If you’re unsure of the local laws, just ask a police officer. They will be able to assist you with laws that you may be unfamiliar with. The AirMap app, available for free download on your phone, shows you the areas that are a no-fly zone. It’s a great app to have when flying drones. Never fly over crowds, directly from the cruise ship, or right at the cruise port itself. If the local laws allow for you to fly, I like to walk down 15-20 minutes from the port and launch from there. Which cruise lines allow what? All information below was current at the time of press. Drones may be brought on board but can only be used off the ship, for port use only. Drones must be stored in the guest’s stateroom. Guests are welcome to bring drones on their cruise for use on land only and outside of the port area. 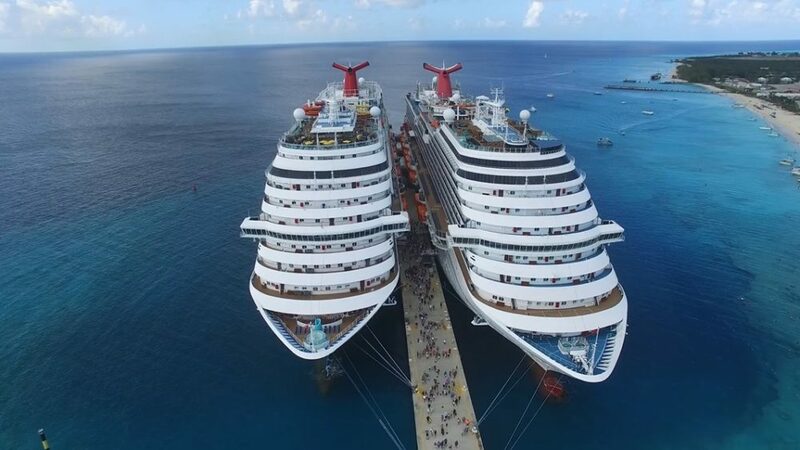 However, drones are not to be operated onboard the ship at any time, nor on Royal Caribbean’s private destinations: CocoCay, Bahamas or Labadee, Haiti. While onboard, drones must be stored safely in the stateroom. Drones used on the ship will be confiscated until the end of the cruise. A Guest Conduct Policy warning will be issued and guests may be subject to disembarkation at their own expense for onboard drone usage. Guests assume full responsibility for understanding all local authority rules related to drone usage and for obtaining any required permissions for drone operations. Different countries may have different rules. Any liability, including environmental damage from drone usage is the guest’s responsibility. Royal Caribbean assumes no liability for guest drones that may be confiscated by local authorities for violating local laws or for any accident or injury resulting from a guest drone flight. Guests are not permitted to bring drones onboard for the safety of other guests, as well as the welfare of the vessel. Guests are welcome to bring drones on their cruise for use on land only and outside of the port area. Drones are not to be operated onboard the ship at any time. Different countries may have different rules. Guests assume full responsibility for understanding all local authority rules related to drone usage and for obtaining any required permissions for drone operations. Any liability, including environmental damage from drone usage, is the guest’s responsibility. Royal Caribbean assumes no liability for guest drones that may be confiscated by local authorities for violating local laws or for any accident or injury resulting from a guest drone flight. While onboard, drones must be stored safely in the stateroom. Drones used on the ship will be confiscated till the end of the cruise. A Guest Conduct Policy warning will be issued and guests may be subject to disembarkation at their own expense for onboard drone usage. Drones are not to be operated on either of Royal Caribbean’s private destinations: CocoCay, Bahamas or Labadee, Haiti. Remote-controlled helicopters, airplanes, drones or similar devices are not allowed on Disney cruise ships or on the cruise line’s private island in the Bahamas, Castaway Cay. Drones also referred to as Unmanned Aerial Vehicle (UAV) or Remotely Piloted Aerial Vehicle (RPA), and any other remote controlled aerial devices/toys are not allowed to be brought on board. For safety reasons drones and any other remote controlled aerial devices/toysare not allowed onboard Holland America Line ships. You if you are thinking about buying a drone for an upcoming cruise, here are a few recommendations for the best drones to bring with you. DJI Mavic Air – This is my go to drone for travel. Why? Because it folds up and fits into a small case and is perfect for traveling. If you don’t want a drone that takes up a lot of space when packing, then this one is for you. While the drone may be small, it has a 20 minute flight time, takes 12 MP photos, and shoots video up to 4K at 30 fps. It also shoots full HD video at 120 fps. The Asteroid video mode also makes for incredibly cool 10 second videos. Price: $779 on Amazon.com. DJI Phantom 4 Pro – For the very best in video and photo quality, it’s hard to beat the Phantom 4 Pro from DJI. While the drone takes up more real estate in your luggage than other drones, the picture quality is hard to beat. Price: $1,499 on Amazon.com. DJI Mavic Pro – A drone that fits between the Mavic Air and Phantom 4 Pro, the Mavic Pro folds up nicely so it also makes a great drone for traveling. Price: $845 on Amazon.com. GoPro Karma – While GoPro stopped making their Karma drone (it’s still available for sale), it has one feature that makes it incredibly useful on cruises. You can take the GoPro camera off the drone, pop it into a handheld stabilizer that comes with the drone, and use it to take awesome videos while you are on the ship. The drone also folds up to help with packing. The controller has a video screen so there is no need to use your phone with it. This is something I hope DJI starts incorporating into their controllers. One other feature that can come in extremely handy is that someone else can control the drone camera with an app on their phone. This allows one person to concentrate on flying, while another person can get the perfect photos and videos. However, the Karma drone itself isn’t as good as the ones made by DJI. Price: $849 on Amazon.com (includes a GoPro HERO6 – $399 value). Whichever drone you choose for your upcoming cruise, make sure you abide by local laws. If you’re not sure, a little common sense can go a long way. Barcelona Travel Guide and Travel Information.